Idli chilli or chilly idly is a popular street food found across restaurants and handcarts in and around Tamilnadu. The dish is so popular that I have seen restaurant menus in delhi and the north featuring this dish. 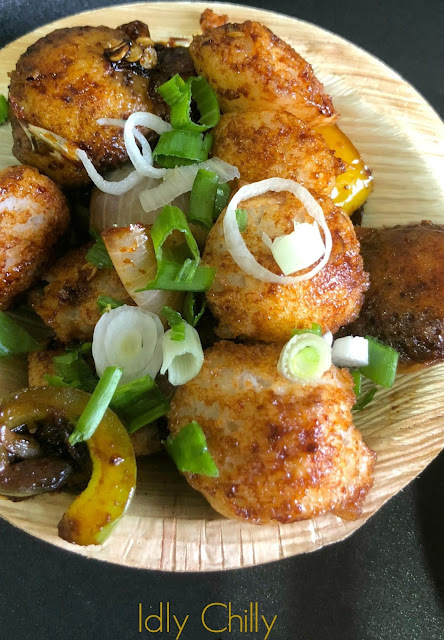 There’s another dish called idli 65 (which again is based on chicken 65, that’s similar to idli chilly :) that recipe for another day ! Bell pepper / capsicum + onions- both cut into squares - 1/2 cup together. In a wok, heat oil till smoking hot. Add onions, green chillies, ginger and garlic. Sauté till onions turn pink, now add peppers, sauces and sauté till sauce covers all the veggies. Now add fried OR baked idli pieces and sauté wel for 2-3 Mins. Top with chopped spring onion and serve immediately. Any name you give, if it has Indo Chinese flavors it is always a win-win at home. Looks awesome. I like these kind of indo chinese food. This idly chili is so apt for using the leftover idly and also makes a great tea time snack. Yum!!! WHo can resist to this incredible idly chilli, what a lovely way to finish the leftover idlies. Would love to have some anytime. 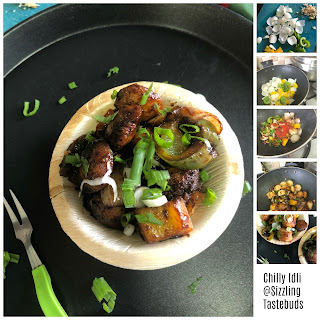 Interesting concept of baked idli and then to make idli chilli..I love this fusion and specially at one of the Mumbai restaurants..cant remember the name of the restaurant but it has the best idli chilli....next to yours;))lol. Love this Indo Chinese version Kalyani! Using baked idlis sounds interesting! Nice one Kalyani. This type of Indo Chinese goes well for kids. I guess even my daughter would love it. Though I have never tried making this indo chinese with idlis, the recipe surely sounds sinful! 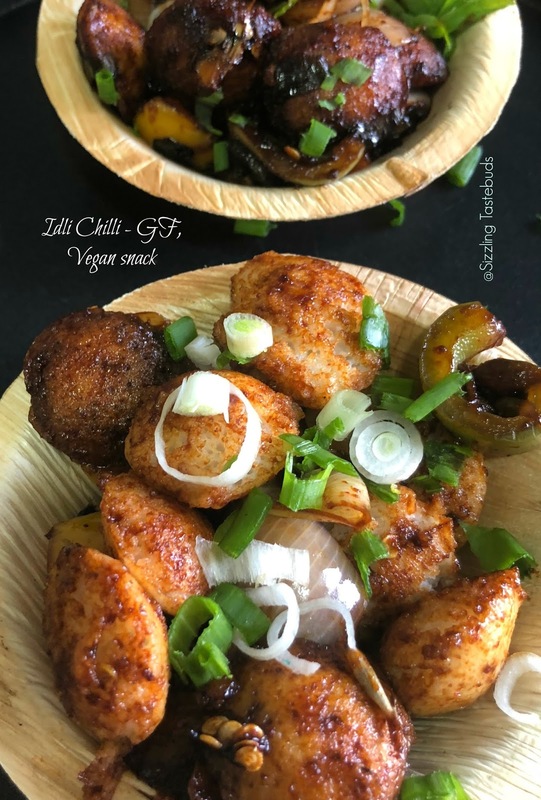 Super tempting chilli idlis!! Am tempted now !! What a yummy idea to use idli to make this addictive appetizer. Idli chili looks so inviting and amazing. Same pinch. I made similar idli manchurain recipe today. Love the idea of mini baked idlis. Superb Kalyani. Chilli idli look so so tempting and I love the fact that you baked them instead of deep frying. What a unique way to serve idli...making it like chili paneer but using idlis. Looks very tempting. A pretty makeover to our humble idly! I make them when I have idly leftovers, mostly kids will gobble fried idlies as it is made, have to safe enough for the chili! I would love to have a bowl of this now, makes me hungry!! This is what I call the perfect bite Kalyani! I am not an idli fan, but I can eat idli anytime of the day using it in as Idli chili. Lovely flavors and baking the idlis sounds like a wonderful idea. Wow.. love the way you used idli... in chinese form. Love the idli chili recipe. Perfectly done.